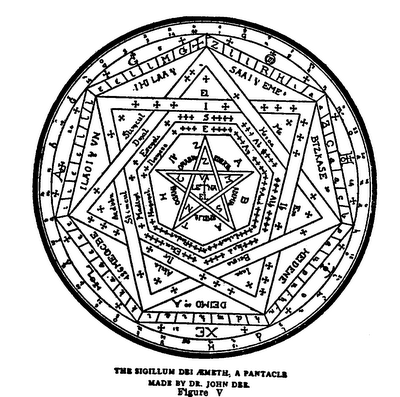 Occult: Supernatural, mystical, or magical beliefs, practices, or phenomena. "occult." Oxford Dictionaries. Oxford University Press. 24 May. 2015. oxforddictionaries.com. Supernatural: (Of a manifestation or event) attributed to some force beyond scientific understanding or the laws of nature. "supernatural." Oxford Dictionaries. Oxford University Press. 24 May. 2015. oxforddictionaries.com. Magical Thinking: the attribution of causal relationships between actions and events which cannot be justified by reason and observation. In religion, folk religion, and superstitious beliefs, the correlation posited is often between religious ritual, prayer, sacrifice, or the observance of a taboo, and an expected benefit or recompense. "magical thinking." Wikipedia. 24 May. 2015. wikipedia.com. Simply believing in a god is an example of belief in the supernatural. God cannot be proven by any empirically valid test. To those in the modern Church, this may seem odd because the Church itself appears to have stopped seeing the world through the lens of the supernatural. But todays Mormons are forced to either reject the supernatural, and therefore reject Joseph Smith and his prophetic heirs, or come up with a in which the supernatural is feasible, yet manageable through only Mormon-approved channels. Oaks does not dismiss folk magic as a means of spiritual guidance, but rather categorizes spiritual guidance as either real or counterfeit: Godly or Satanic. The young men should understand the reality of Satan, but you should not talk too much about him or relate personal experiences with the power of evil. Avoid discussing the occult. If the young men bring up such subjects as Ouija boards, s�ances, spiritualism, or Satan worship, you should tell them that such things are tools of Satan and that we have been counseled to avoid them completely. "Lesson 11: Satan and His Temptations," Aaronic Priesthood Manual 2, (1993), pp. 37-40. From the perspective of those outside the faith, members of The Church of Jesus Christ of Latter-day Saints today still see the world in the same way Joseph Smith did. The Church and its people have not lost their link with the occult, they have simply transformed the ritual objects into other objects, or a belief that no objects are needed to get in touch with the supernatural. In Mormonism, the greatest link to magical thinking is related to the term "priesthood." It is believed that the priesthood is the power to act in God's stead. [T]he rights of the priesthood are inseparably connected with the powers of heaven, and. the powers of heaven cannot be controlled nor handled only upon the principles of righteousness.